More than a quarter of seafarers show signs of depression - and many won’t ask for help, according to a study of seafarers’ mental health presented at Sailors’ Society’s Wellness at Sea conference on March 16, London. Some 26 per cent of seafarers said they had felt “down, depressed or hopeless” on several days over the previous two weeks. The seafarers said the quality and amount of food on board can have a big impact on their mental health, alongside isolation from their families and length of their contracts. Nearly half (45 per cent) of the seafarers who reported symptoms of depression said they had not asked anybody for help. Around one-third said they had turned to family and/or friends, but only 21 per cent said they had spoken to a colleague, despite spending months on a ship with them. Sailors’ Society’s Wellness at Sea conference brought maritime leaders together to discuss the importance of seafarer wellness, its impact on the industry and how to combat problems like depression. Dan Thompson, 29, from London, who had to take time out from his job as a navigation officer when he became depressed, spoke at the conference to raise awareness of the problem. He said: “The reason I became ill was primarily my job – the workload, the sleep deprivation and the pressures of the job. “Having lived at sea I would anticipate the numbers of people suffering from depression to be even higher than those who admitted it in the survey. Sailors’ Society, which celebrated its 200th anniversary this month (March 18), announced the survey results to more than 100 industry figures attending its Wellness at Sea Conference. Sailors’ Society Deputy CEO Sandra Welch said: “Seafarers spend months on end at sea, facing some of the toughest conditions of any workforce – isolation, cramped living quarters, noise, heat, storms – sometimes they’re not even able to stomach the food on board. “This report is a wake-up call to the industry about the huge impact this is having on seafarers’ mental health. 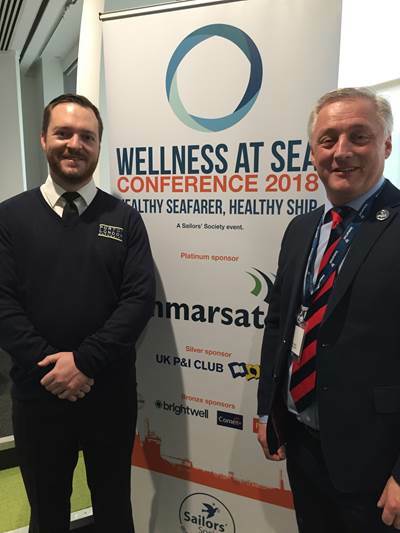 Held at platinum sponsor Inmarsat’s 99 City Road conference facilities, the Wellness at Sea conference was chaired by Sailors’ Society CEO Stuart Rivers, with Euronav’s CEO Paddy Rodgers as keynote speaker. The event featured presentations from all areas of the shipping industry including from Kuba Szymanski (InterManager), Sophia Bullard (UK P&I Club), Bridget Hogan (Nautical Institute), as well as a lively panel debate chaired by TradeWinds Editor, Julian Bray, with Paddy Rodgers, Drew Brandy (Inmarsat), Ella Hagell (Tindell Riley [Britannia] Ltd) and Mark Robertshaw (Brightwell Payments). In addition to headline sponsor Inmarsat, the conference was supported by silver sponsor UK P&I Club, and bronze sponsors Brightwell Payments, Wescom Signal & Rescue UK Ltd and Future Care Inc.
Maritime charity Sailors’ Society, which works with seafarers in 91 ports around the world, offers counselling and support to those struggling with depression. Its Wellness at Sea coaching program and app teach seafarers about wellness and give them practical tools to help them stay physically and mentally fit at sea.